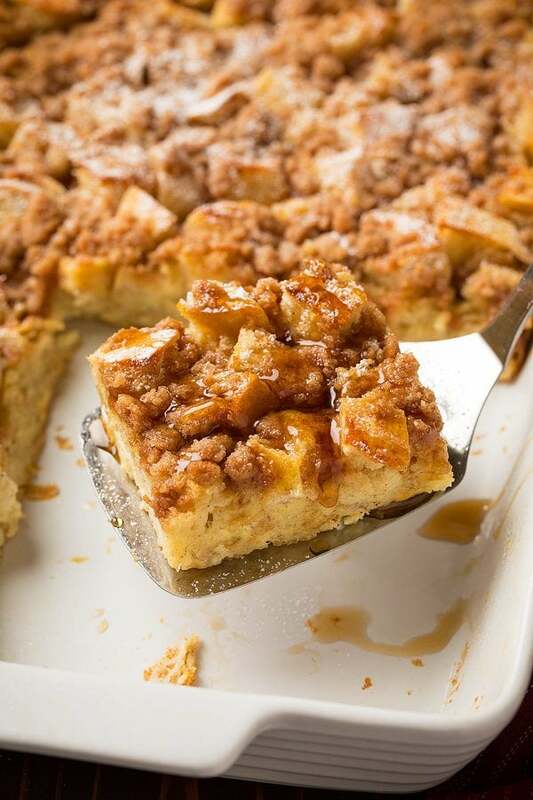 Overnight French Toast Casserole has all the goodness of French toast and then some thanks to that sweet crumble topping! It’s made with a rich, cinnamony custard-soaked sourdough bread and even the pickiest eaters will love it. It makes for the perfect holiday or weekend breakfast, and you’ll love that you can make it the night before serving! Christmas breakfast is always a big deal, right? It’s one of those meals I look forward to all year. For Christmas breakfast, we always have lots of fresh fruit, bacon, breakfast potatoes, fresh orange juice and then something like Belgian Waffles or Red Velvet Pancakes. This year though, I’d like to be able to make most of the main dish the night before, so I’m going with this seriously delicious Overnight French Toast Bake! 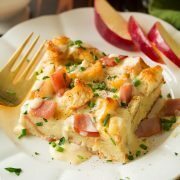 With this make ahead French toast casserole recipe, the fresh bread is diced up into cubes then soaked overnight in a rich custard that has plenty of that ever so creamy and lovely half and half. And the following morning all you have to do is take it out of the fridge, preheat the oven, sprinkle it with a simple cinnamon crumble and bake it up. 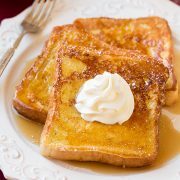 Oh, and let’s not forget finishing the overnight french toast with melted butter and maple syrup! 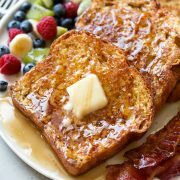 What’s the Best Bread for French Toast? The base for this overnight french toast casserole is made with sourdough bread, not the first thing you’d thick to make french toast with maybe, but I started using sourdough for french toast about 10 years ago and I’ve been hooked ever since. The sourdough offers a nice slightly tangy flavor similar to that in buttermilk or sour cream pancakes. It just gives it more flavor overall because white bread can be pretty bland and boring. 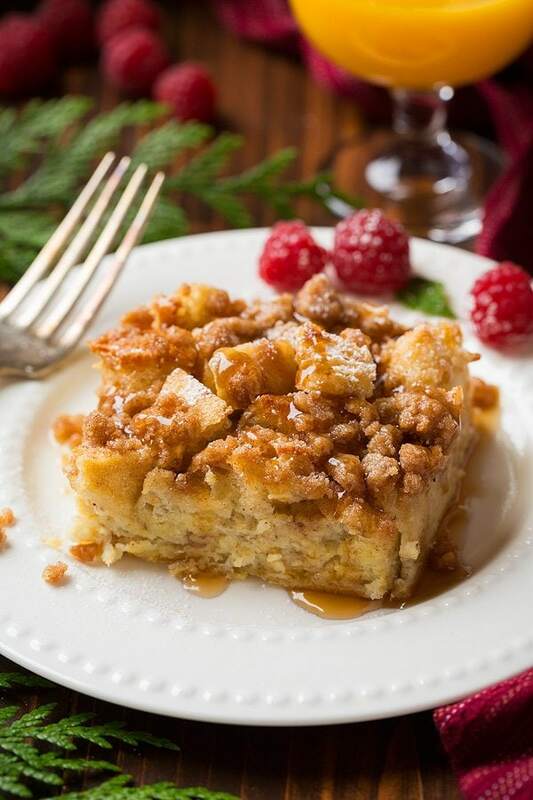 The French toast casserole itself isn’t very sweet at all, as the topping and the maple syrup bring almost all of the sweetness here. So don’t leave them off! I didn’t want things to be overly sweet, so once you finish it off with maple syrup it has the perfect balance of sweetness. Oh, and you of course should serve this breakfast casserole warm! For easier, less messy cutting, transfer the loaf of bread to a plastic bag if it’s in a paper bag and let it sit for a day. It makes cutting easier and less messy. If you don’t have a mixing bowl with a pour spout at the end, you can transfer the egg mixture to a liquid measuring cup with a pour spout and pour it onto the breakfast casserole from there. Finally, a Delicious Breakfast Casserole Recipe! 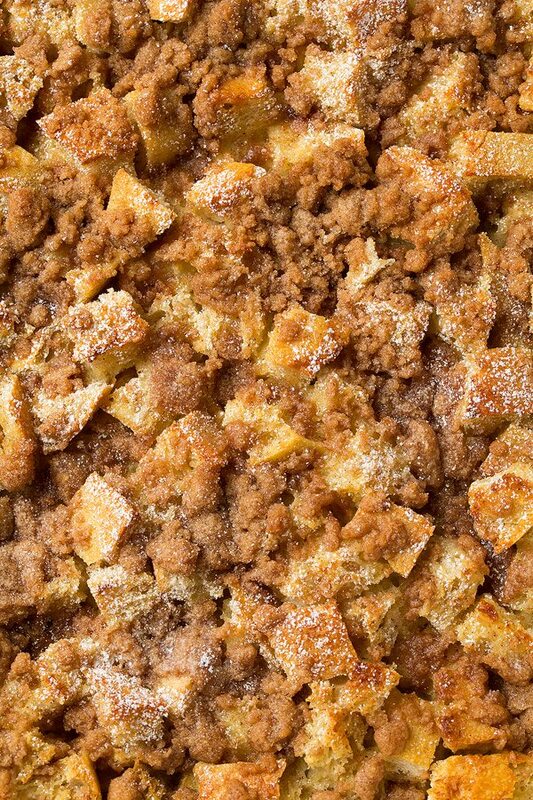 I’m not one who loves casseroles, but this french toast bake is a major exception. I love everything about this breakfast casserole! It’s so good, in fact, that I think you need to do one trial run before Christmas, right? I hope you all have a wonderful holiday week filled with good times and good food! 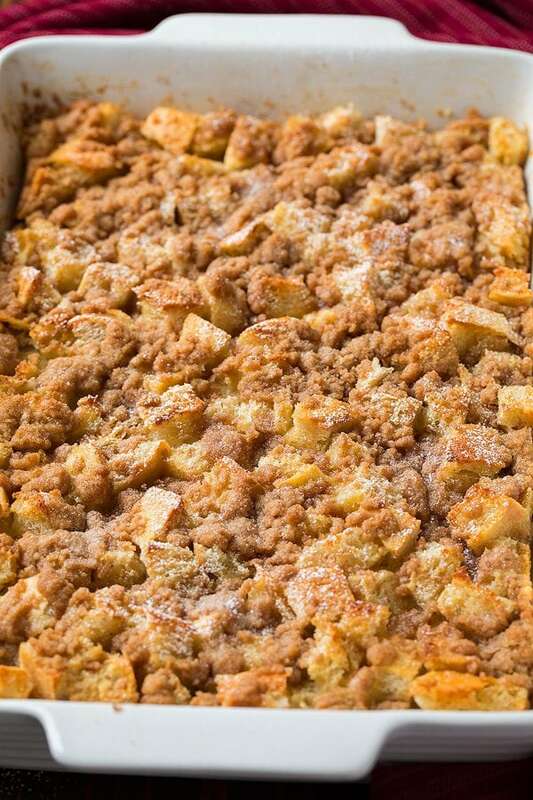 Overnight French Toast Casserole has all the goodness of French toast and then some thanks to that sweet crumble topping! It's made with a rich, cinnamony custard soaked sourdough bread and even the pickiest eaters will love it. It makes perfect holiday or weekend breakfast, and you'll love that you can make it the night before serving! For the French toast: Butter a 13 by 9-inch baking dish. Add bread cubes to baking dish spreading them into an even layer. In a mixing bowl with a pour spout** whisk together sugar, cinnamon and nutmeg. Add in eggs and whisk until well blended, while scraping bowl. Pour in milk, half and half and vanilla and whisk until well blended. Slowly and evenly pour egg mixture over bread cubes working to coat all of them (if you miss a few just turn and dunk them into the custard that's in the dish). Cover with plastic wrap and chill overnight, or at least 10 hours. In the morning preheat oven to 350 degrees and while oven is preheating remove casserole from fridge and let rest at room temperature, it should rest about 15 minutes. Also, prepare crumble while oven is preheating. For the crumble: In a medium mixing bowl whisk together flour, brown sugar, cinnamon and salt. Add butter and cut into flour mixture using a pastry cutter or a long pronged fork until mixture resembles coarse crumbs, transfer to fridge if oven hasn't fully preheated yet then add it just before placing casserole in oven. Sprinkle casserole evenly with crumble then bake in preheated oven until set and center is cooked through and no longer soggy, about 38 - 45 minutes. Let cool a few minutes, pour melted butter over top, dust with powdered sugar if desired, then cut into squares and serve warm drizzling each serving with maple syrup. *I recommend using hearty bread like La Brea. Hearty French bread can be used as well. *For easier, less messy cutting transfer bread to a plastic bag if it's in a paper bag and let it sit for a day. It makes cutting easier and less messy. **If you don't have a mixing bowl with a pour spout at the end mixing you can transfer the egg mixture to a liquid measuring cup with a pour spout and pour it from there. The casserole itself isn't that sweet so don't leave off the maple syrup. Syrup is not included in nutritional info.